Whether it’s 2- or 3D, Titanic has examples which can be used to illustrate the nature of God. When Jack and Rose are desperately trying to reach the top of the ship after it starts sinking, they make time to unselfishly try to save a little boy. This is in direct contrast to Cal’s behavior: he poses as a girl’s father just to secure his place on a lifeboat. 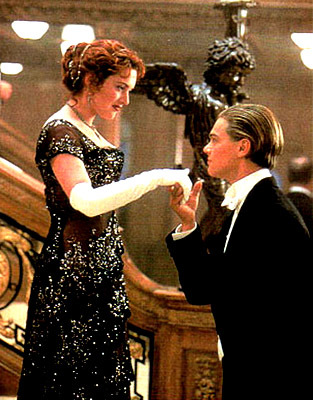 A theme throughout the movie is the difference between the classes of people – even when Rose’s mother gets in the lifeboat, she wonders if there’s special seating for First Class passengers. But with the ending, when we can assume Rose dies and is reunited with Jack in Heaven, there is no distinction amongst the people celebrating their reunion – even the Captain is standing next to a Third Class passenger. What a wonderful way to illustrated what Paul said about there being no differentiation between people in Christ, as well as what the Letter of James says about discrimination!